Welcome to the Student Conduct and Community Standards office at Walsh University. Our office works to strengthen personal responsibility and accountability by addressing violations of University policy through the University conduct system. We want you to be a successful and responsible member of our community throughout your time at Walsh. As a member of our campus community, the University expects all students to abide by the student conduct code both on and off campus. Please take a moment to learn about our office, policies, and educational programs. The mission of the Walsh University Conduct System is to foster a sense of responsibility for personal and community standards through education and personal accountability. This is achieved by consistently reviewing and determining appropriate conduct responses in cases involving violations of federal, state, and local law, as well as University policies and student association regulations. Our conduct process is grounded in the concept of fairness and impartiality, thereby supporting the values of our community by addressing misconduct in a constructive and positive way. Walsh University expects all members of the campus community to uphold and abide by the moral and educational values of our Judeo-Christian tradition. College years offer the student the opportunity for intellectual and personal growth. To foster this growth, this handbook presents important policies describing the behaviors expected of Walsh students and the services students can expect from the University. The Student Handbook is a guide for the academic year. This handbook states general policies designed to serve the best interests of the University community and describes nonacademic life with its campus services and activities. It supplements the University Catalog, which provides information concerning academic programs, course descriptions, degree requirements, and financial commitments. Download a PDF at the bottom this page. Unless otherwise specified, the policies and procedures outlined in this handbook pertain to all students. 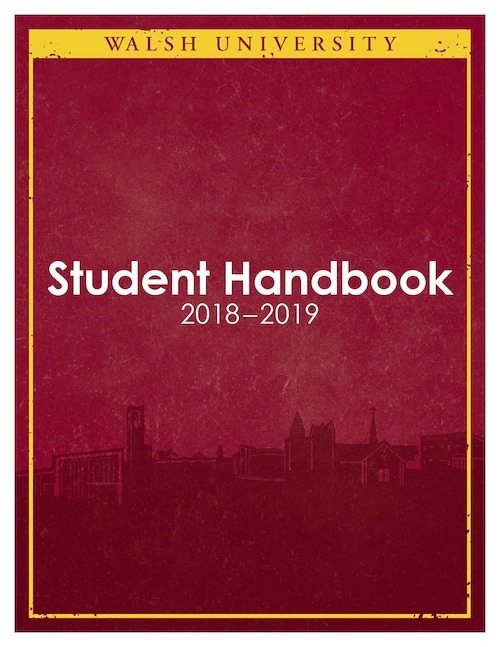 By becoming members of the Walsh student body, persons bind themselves to comply with the policies explained in this handbook. It is the responsibility of the students to know the requirements and the policies of the University, especially those stated in the Catalog and the Student Handbook.